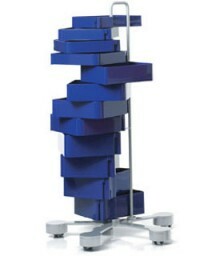 The “Spinny Cabinet,” is a set of free-swinging drawers stacked vertically on a 60″ pole on castors. The twelve drawers rotate 180 degrees around the center bar and come in differing heights as well as in four different colors (black, white, red, or blue). Design Joe Colombo Studio, 2005. Injection-molded ABS. Made in Italy by B-Line. 49.2” h | 29.1” dia.